Back on the Road | Is a Hot Dog Day a Sandwich Day? Is a Hot Dog Day a Sandwich Day? National Hot Dog Day is quickly approaching on Wednesday, July 18. Obviously, the question on everyone’s minds is “Is this sandwich day or not?” The word sandwich is defined as “an item of food consisting of two pieces of bread with meat, cheese, or other fillings between them, eaten as a light meal.” By definition a hot dog bun, while it can be ripped into two pieces, is only one piece of bread. But then this raises the question: What about a hoagie or sub bun? Those pieces of bread are usually connected on one side like a hot dog bun but we refer to them as a hoagie sandwich or a sub sandwich. So why is the debate always about hot dogs? Maybe it’s because they’d be upright sandwiches and we’re scared of labels? Maybe it’s because the words “hot dog” and “sandwich” in succession just leave a bad taste in your mouth. Or maybe it’s because originally hot dogs were just supposed to be eaten plain. The hot dog bun was introduced to make it possible to eat hot dogs without burning one’s hands. Have you ever tried to eat a sandwich without a bun in your hands? It is pretty messy and a bit more difficult, as that guy you know who is cutting back on carbs can attest. Is a hot dog a sandwich? To be honest, we still don’t know. We can see both sides of the bun on this. 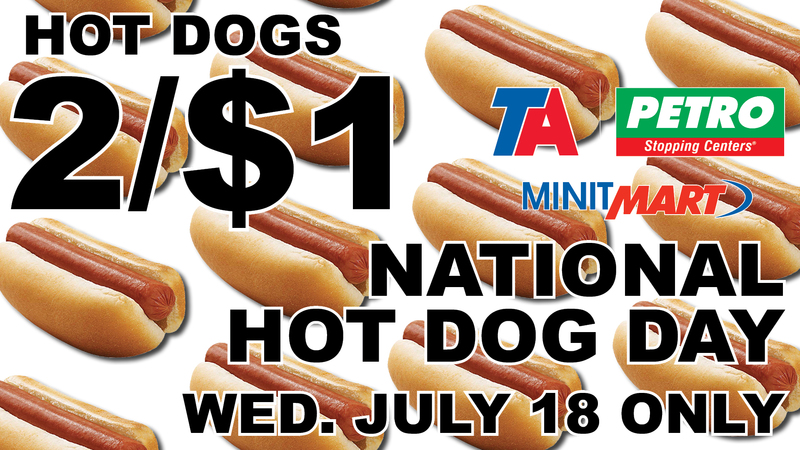 What we do know is on National Hot Dog Day (Wednesday, July 18) you can stop into any TA and Petro Stopping Center and Minit Mart convenience store and get two hot dogs for only $1. The offer will be valid July 18th only. We hope to celebrate with you! TA and Petro Stopping Centers and Minit Marts are running hot dogs 2/$1 for National Hot Dog Day. Thankful Thursdays are back at TA, Petro and TA Express! Candy Craziness matched up our best candies. The TA Truck Service Challenge celebrates the valuable role hauler drivers play in NASCAR racing. Brendan Greene takes the early lead this year after back-to-back wins. After five weeks of grueling Candy Craziness, the finals are set. The satisfied Snickers vs. Tootsie Roll Pops. © 2019 TravelCenters of America.